Mangaluru, April 20, 2017 :Reports confirm that all effort is on to promote Kaup beach, located about 18 km from from Udupi, as a major tourist destination. 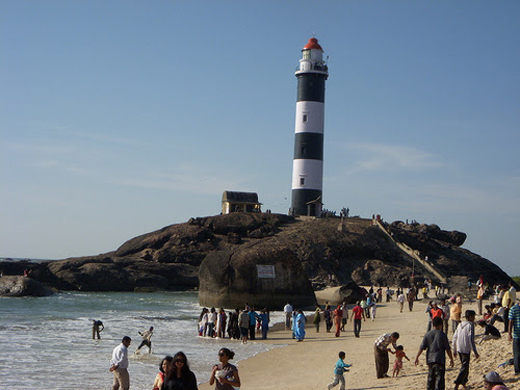 The majestic lighthouse located on a 12-metre high boulder adds to the beauty and grandeur of this beach. This 34-metre high lighthouse — painted in white and black bands — faces the Arabian Sea and was built by the British Company called, ’Chance Brothers’ in 1901, the light equipment was electrified about 3 decades ago. It is estimated that about 1,000 people visit this beach on weekdays, while it gets about 5,000 footfalls during weekends. This figure sees an increase during vacations. In order to attract more visitors, plans estimated at Rs. 87 lakh under the Coastal Circuit Project have been drawn up. “These plans include landscaping, installation of high-mast lamps, construction of a lifeguard tower, and solid waste management at the beach,” Assistant Director of Tourism B.R. Anitha said. Already a pathway has been constructed on one side of the beach and its construction on the other side is on. More granite benches will be installed close to these pathways. The beach is also being developed with private partnership and there are also plans to promote scuba diving and also homestay near the beach. “We plan to start scuba diving at the beach in October or November this year if the weather permits. This project is expected to cost around Rs. 1 crore,” Yatish Baikampady, head of the private agency which oversees tourism promotion and development of the beach, said. Already awareness programmes have been conducted to promote homestay for owners of houses near the beach. This is expected to give a major boost to the local economy. “Already three house owners have shown interest in promoting homestays in their houses. This will also help the tourists to taste authentic ethnic cuisine, especially sea food. They could also be taken to show Kairampani or seashore fishing. When people start staying, the income generation from tourism goes up,” Baikampady added. A proposal has also been floated to construct a two-lane road directly from National Highway 66 to the beach to improve connectivity. Presently narrow roads provide connectivity to the beach. The Kaup Town Municipal Council (TMC) , which came into existence about a year ago, will be constructing a toilet complex at the beach and installing high-mast lamps. “We want to provide facilities to attract more tourists to the beach,” said Rayappa, Chief Officer of TMC.